It’s a socially mediated definition that changes based on the latest popular film or story and where that trend in fiction guides popular expectations. If such things are ever made, who can say what they will be known as? What I am getting at is that if you can have a name you concoct and a credible reason for that name within the internal social logic of your story, you will not destroy the suspension of disbelief essential to your readers. Well, I do like the idea that I have the power, but I worry I might let it go to my head. I believe it was author Edmond Hamilton, author of the 1950-1960’s Captain Future sci-fi series who defined for me my basic understanding of the difference. He had one crewmember on his ship who was a robot (a built mechanism), and one android (a scientifically grown organism). The difference being, an android is just as artificial as a robot, but was inherently organic. The composition was understood not to be identical to a true human’s, but usually understood to be tougher, faster, smarter (yet occasionally dense when trying to understand humans). So, if it has synthetic organic skin, organs, bones, etc., it is an android. By the implication of the coined word, it has the form of a man. 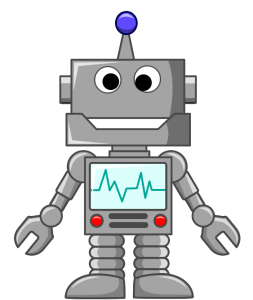 A robot can have any form, but is essentially mechanical. See also Isaac Asimov’s original book, the source of “I Robot”, where his creation is a human like robot, but after several improvements became organic. By this definition, none of those movie icons of atificiality are truly android except our friend from “Alien”, and even he had considerable mechanical additions which didn’t show until he was highly damaged. From one aspiring author to another, I hope this helps. I’m generally with Mr. Wright on this. You can basically choose whatever you want. I mean, you could even have BOTH, and as the writer decide what the definition of each is. As a reader, what I’d want to see is in-world consistency. I’d buy either. Although to get at the meat of the question, it’s my perspective that ‘android’ implies an independent intelligence, where as ‘robot’ implies limited programming and no intelligence. This would provide explanation as to why the droids in Star Wars are droids and not robots. They have independent intelligence. So possibly if it’s smart its an android. If its dumb, its a robot. But I think in the world in my head and hopefully one day in my book, I’ll probably go with androids looking like humans and robots being obviously made out of metal. I think that angle will totally work. I think it’s just as good as using intelligence. Plus, it’s your world, and you get to choose! I’m with Koster. You have the power to choose. But the consistencies must be present within your realm. Although – on another note I have always ascribed to the thought that an Android has some sentient thought. So while R2D2 may look like a bucket of bolts, he has the ability to think and some emotional qualities. But back to the original point – it would not seem unlike the idea of vampires or fairies or,elves within a story. There are so many different qualities ascribed to all of those beasties. But I would be able to suspend reality and take any of those thoughts as long as there was consistency within the story. Huh, I definitely would call C-3PO an android, myself. He’s human-like enough. But I agree with every else — you define the term for your world. Another thing to consider: would robots with female characteristics be called “gynoids?” Or is “android” an overarching term like “mankind,” especially given that robots are, theoretically, sexless/genderless. Again, it all depends on your worldbuilding! Fun(?) fact: The Star Wars robots are never referred to as “androids,” merely “droids.” Thus, Lucas literally making the term his own. If you look at the tiny print on the Droid cellphone commercials, you will see that “droid” is a Lucasfilm trademark. You just blew my mind that Lucas owns the word “droid.” Almost seems wrong. Droid should belong to us all. Oh well. I enjoy all of this, I just wonder if Terminator the T-1000 swartzenager is an android or a cyborg? It is a humanoid android, with biologic human flesh, though it is artificially grown, which could classify the skin as synthetic, depending on that definition. That’s a tough one. I’m going to say not a cyborg because the flesh alone (without organs) is basically just a covering for the metal. I’d say he’s an android since one can’t tell he’s a robot just by looking at him. I guess personally I see androids as robots that have something approaching a true AI. All androids are robots, but not all robots are androids? OK – terminators – androids or robots? Oooh good question. I’m gonna vote android, but I haven’t seen all the movies, so I might be missing something. Terminators are hybrids, less geeky looking Cyborgs but mostly android with two pinches of human – human flesh zipped over metal framework. And that’s the opposite of RoboCop all machine with a human brain, brain stem and spine. My guess is the spine is needed for the brain to communicate to the machine parts. I would definitely say that “android” is a robot designed to mimic human behaviour and appearance (eg: Blade Runner) whilst a robot can be any shape of automated mechanical thing. Stuff that’s in a bipedal, humanoid shape like C-3PO or Bender from Futurama are definitely humanoid shaped but not necessarily androids. Then we also have a separate category for A.I, which can simply be a disembodied intelligence that exists inside a computer and can be transferred to other machines. All androids are robots but only some robots are androids. Were the Replicants in Blade Runner actual machines i.e. fake flesh over metal or some kind of clones i.e. synthesized humans, almost like a biological robot? I always got the impression they were the latter, but never really understood the significance until I started watching Battlestar Galactica (the newer version) with the humanized psylons. I would guess this is a sliding scale. Robots range from the nuts-and-bolts machines that work on assembly lines through to human-like beings like C3P0. Androids/droids are clearly human-like in design, probably of human-like intelligence and may be a mix of synthetic and biological construction. Cyborgs are synthetic humans. Then on the other side of the fence, you have transhumans, who are artificially modified humans, and post-humans who are so modified that they have become something else entirely, and may even resemble droids. So what are Replicants and or the humanish Psylons from the modern Battlestar Galactica? I assume they fall into the last category you mention. I would label Replicants as androids or cyborgs. Cylons were originally androids, but the new-style humanoid Cylons seem to be cyborgs. It may be helpful to define the context in which your machine is being used in order to better clarify the line between the two. For my own purposes, for example, robots are tools. Androids are lovers. You rival me in your sense of humor, sir. You’ll fit in just fine around here. Thanks. Come to think of it, I am kinda the Marquis de Sade of puns. Seems to me that Robots don’t have any affect. C3PO had no facial expressions or body language. He wasn’t wasn’t threatening. Most of the droids have “emotions,” can pass, have human form and seem to be able to think and act like humans. It’s a tough question because films portray them in an interchangeable way but I don’t think they are. Bots seem metallic, their movements restricted and stiff, if they bend at all, while droids are graceful and move the way we do. They can run, climb, do everything a human can do. They usually have facial expressions and can elicit emotion from us. They may be programed but they can think for themselves as well, at least some of them can now days. They can pass while robots are normally unable to do that. One thing to keep in mind is that with androids it assumes that humans are the designers. If you have alien species in our story then your androids do not necessarily have to be designed to look human. They only need to look like the species that designed them. I believe that’s why Lucas dropped the prefix for star wars since it specifically refers to man. Also, an android has the form or likeness of a human. Since it’s an “or” it doesn’t necessarily have to meet both qualifications. I would say that even if a robot didn’t have a human or or even humanoid appearance it could still be an android if it had human-like emotions. In the end it’s your world so you get to decide. I would suggest making a definition for your wold that you stick to or even make one or more new words to make your own distinctions. Just make sure to stick with the rules you setup. That’s what your readers will really be worried about. Thats true. There are many aliens who could make androids. I think this is a great topic to discuss. You make me think of robots, androids, and cyborg. Robots are totally mechanical and can come in all sorts of shapes and sizes. They may or may not need human intervention to operate, but like a drone, they might. An Android is fully independent and does not need human assistance to perform its duties. They are capable of doing jobs that humans can’t or won’t do while fitting into society more than a robot. Where robots are more subservient at times, androids can be more aware of themselves and their own uniqueness. Let’s just throw a monkey wrench and talk about the hybrid of human and machine: cyborg. These try to be more than a robot and closer to an android. However, human intervention is needed for this creation to function. So, like the Borg, they have created a co-dependancy with man, while at the same time, trying to be better and self-sufficient. What a mess, right. I like your ideas. Keep on working on your book. Don’t give up. If you have an idea, stick with it. I am working on my second book and it is a long process. It can be done. I would like to send you a link to my Realm of Nerdatonium and our new blog God Among Geeks. Let me know if you want to be in the discussions. Thanks for dropping by. Sure post the link. This is one of my most visited posts so it is interesting to see there are a lot of people out there searching for info about robots, androids, etc. You bet. Keep us posted. Does android push into the AI area. The word Robot is based on a Russian word robotnik which roughly translates as ‘slave’. This is the way robots are presented in Asimov’s books, hence the three laws of robotics. (A robot must never harm a human being or through inaction allow humans to come to harm, a robot must obey an instruction from a human being except where that contravenes the first law etc.). So a robot is the property of someone else, that person being human. However this view steadily changes as the big existential questions get applied to robots. Can a robot dream? Personally I think the words android and robot are interchangeable when talking about humanoid artificial people. I’m working on a Sci Fi novella at the moment and robots have just appeared. They are humanoid and are indistinguishable from unanswered but I’ve decided just to use the word robot and then be consistent within my story.